If there was any question about the relevance of the Republican Party, this week’s budget deal removes all doubt. 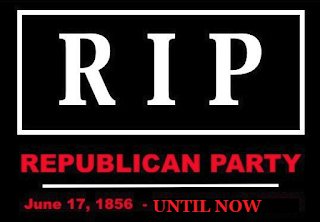 The Republican Party might as well close up shop and merge with the Democrats. Not as a merger of equals, but more of a capitulation, a surrender, a sellout. There is no need for two parties in Washington DC as only one party is relevant in terms of advancing an agenda. The irony is that the agenda driving party is in the minority and despite losing badly in two midterm elections, the Democrats are still running Congress. Another 2000-plus page bill passed by Congress with little transparency or discussion. You mean ObamaCare? No Paul Ryan’s $1.1 trillion spending bill, his first major legislative “achievement” as House Speaker. The deal suspends the debt limit until 2017, well after the presidential election, effectively taking unsustainable debt off the table as a campaign issue. Obama doubled the national debt? So what? Republicans are helping him. Don’t worry though, the spending cuts will take place in 2025, when most of the current Congress voting for this spending spree will either be retired or working as K Street lobbyists. Remember the 2010 GOP “Pledge to America”? Paul Ryan hopes you don’t. Especially some of these key pieces. An unchecked executive, a compliant legislature, and an overreaching judiciary have combined to thwart the will of the people and overturn their votes and their values, striking down long- standing laws and institutions and scorning the deepest beliefs of the American people. What have Republican voters gotten for believing the 2010 “Pledge”? After voting in solid majorities in both the House and Senate, it’s business as usual, as if Nancy Pelosi and Harry Reid were still in charge. Perhaps they are. What has this latest budget deal done to thwart the Obama agenda? Very little. The omnibus bill fully funds Obama’s executive amnesty program. Sanctuary cities are funded -- so much for Kate Steinle’s tragic death bringing attention to sanctuary cities like San Francisco. Refugee resettlement programs are funded, allowing thousands of “refugees” into the country. With access to federal benefits. Ask Europe how that’s working out.